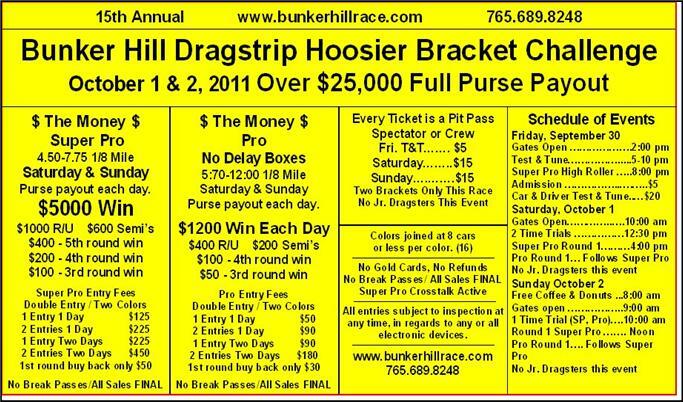 Physical Address: 8672 South 150 W.
Bunker Hill, IN - Big Bucks Bracket Racing comes to Bunker Hill with their Hoosier Bracket Challenge. October 1st and 2nd is the date, over $25,000 in total purse is the payout. $5,000 in Super Pro and $1,200 in Pro for the winners. 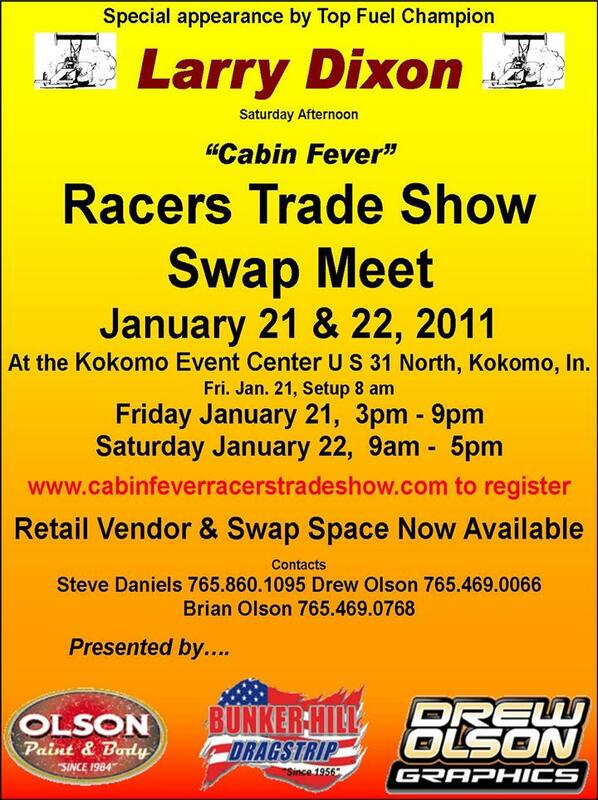 Kokomo, IN - The 2011 "Cabin Fever" Racers Trade Show and Swap Meet comes to Kokomo Indiana. Bunker Hill Dragstrip Operator Steve Daniels, Olson Paint & Body along with Drew Olson Graphics have teamed up to put this event on for the racers. Top Fuel Champion Larry Dixon will be appearing Saturday afternoon. Bunker Hill, IN - Sunday Vickers was again double entered in Super Pro which he won with one entry and lost in the third round with his second Super Pro entry for an overall astonishing weekend record of 21-1. Bunker Hill, IN - Overall, the race was a success and we wanted to thank all the racers and sponsors for their support along with the Bunker Hill staff for their hard work and smooth running program! 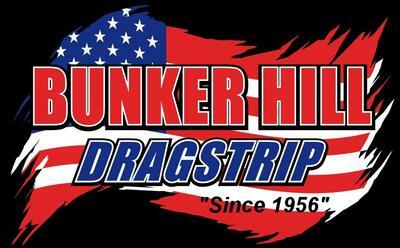 Bunker Hill, IN - Triple O Promotions presents The 2nd Annual No Box Nationals in Bunker Hill, Indiana this weekend. Racers will see a Free Test & Tune on Friday with a Gamblers Race and the chance to win $7,500 on Saturday and Sunday. 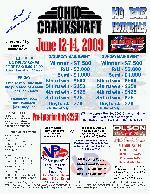 Greenwood, IN - The Second Annual "Ohio Crankshaft No Box Nationals" is now officially back on the schedule for 2009. 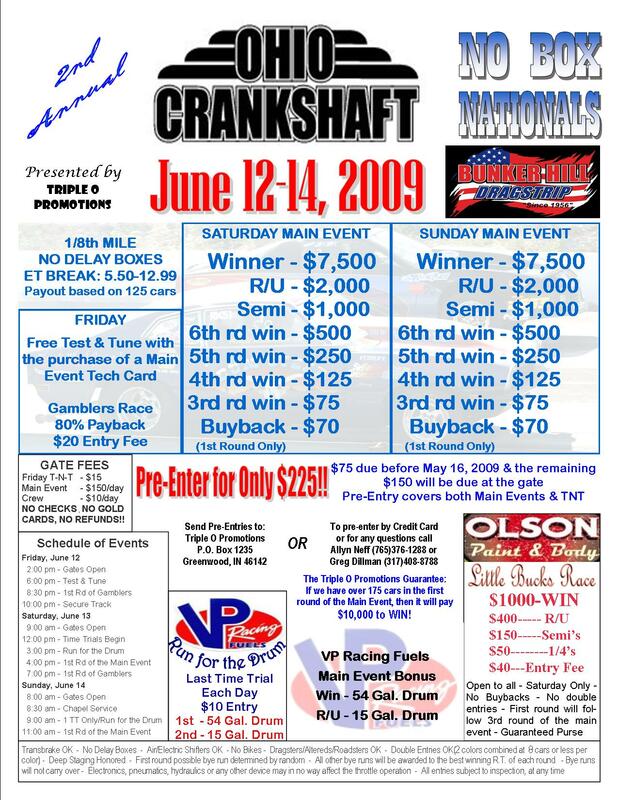 This big money No Box race is scheduled to take place June 12th - 14th, 2009 in Kokomo, Indiana.